« We can’t be gourmands every day! Because we had pancetta, chestnuts and parsley that needed to be used in the fridge we thought we’d try out our first festive side of the season. Cook 500g of brussels sprouts in boiling water for around 5 minute or until cooked. Meanwhile cook 125g pancetta in a little bit of vegetable oil until bronzed and crisp. Add a large knob of butter and 100g cookedchestnuts – squashing the chestnuts to break them up a bit. Add 25ml Marsala and reduce to a syrup. 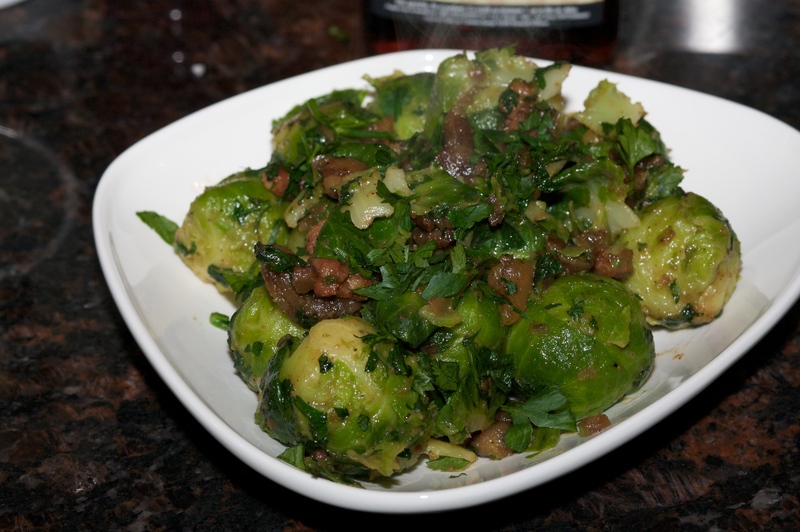 Add the drained Brussel Sprouts, toss and add some parsley and lots of black pepper. Credit to Nigella – recipe from Feast.